Marina's Kitchen Table: Meeting in the Meadow: "Have Joy"
“Have a good time” and “have fun” are common sayings we use with one another. It’s not a bad thing to say to someone, but it does have its limitations. I would like to see a different saying become more common among God’s people. How about if we replace “have fun” with “have joy”? Joy is one of the greatest things we can possess on earth and differs greatly from fun. “Fun” is fine, but we can’t always have fun. Fun depends so much on where we are in a given moment and what we are doing. It’s not fun to be caught in a traffic jam, to have a financial set back, to go through a difficult trial, to be without heat in the winter, or to have a mechanical breakdown when you are trying to meet a deadline. It’s fun to go skiing, but it’s not fun to break your leg; it’s fun to watch a baseball game, but it’s not fun to watch your team lose; it’s fun to eat at a nice restaurant, but it’s not fun to get food poisoning; it’s fun to hook a big trout, but it’s not fun to have it get away. Joy is a grace gift from God, not the result of a particular circumstance that happens in our lives. Joy touches our spirits, fun touches our emotions; joy abides, fun comes and goes; joy flows like deeps waters, fun skips along like a rock upon the water’s surface. Joy is amazing and strength giving. Joy isn’t just for the good times, but for the hard times as well. Jesus knew joy even while going through the agony and suffering of the cross. The joy that Jesus knew is the joy we need to know as we face every circumstance of life—hard or easy, bad or good, pleasant or difficult—and it is His joy that He gives to us. The Lord has blessed by wife with the gift and ministry of hospitality. Early on, the Lord taught her an important lesson about this ministry. She was once served a meal of tortillas and eggs by a Christian woman who lived in an adobe house with dirt floors, in the back country of Mexico. To this day, my wife has never been served more graciously. Her hostess had so little to offer materially and yet she radiated joy in everything she did. It would be fun if my wife had a super gourmet kitchen to work in and the latest fine china to put at each place setting, but that has nothing to do with her ministry or her joy. 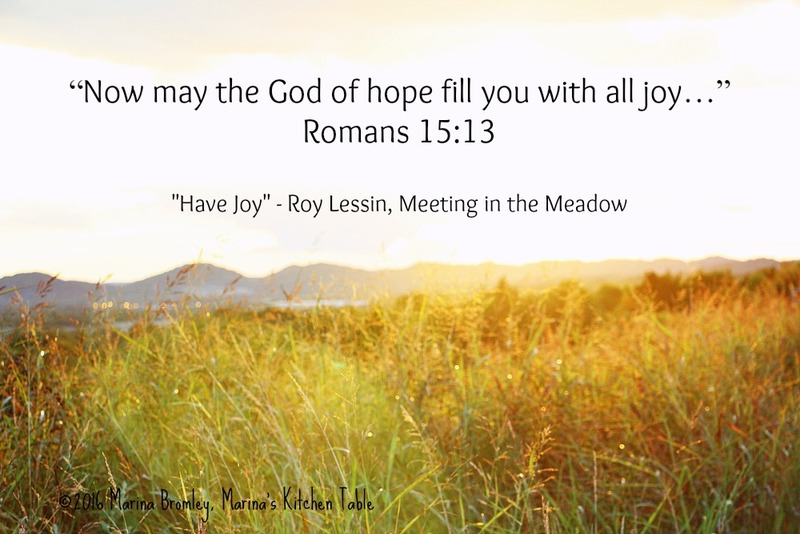 Her joy comes from the Lord, not our kitchen or our dishes. At the end of the evening it may not be fun to face a stack of dirty dishes, but for my wife, the time at the sink is a time of joy. It has become something she looks forward to; it is here that she celebrates her calling, reflects upon the evening, and recalls the ministry of the Lord to those who were in our home. Whatever your day might be, “Have joy”; whatever your circumstances, “Have joy”; whatever you need, “Have joy.” Have God’s joy. Have it in abundance. Have it in its fullness. Be filled with joy. Have the joy of His presence, and the joy of His salvation. May His joy greet at the start of each step of obedience, meet you at the end of every tear, cover you in every trial, and sustain you in every labor of love. May His joy remain. ©2016 Roy Lessin, Meeting in the Meadow, Marina Bromley, Marina's Kitchen Table. This first appeared online in 12/2008.